It’s been an age since I was excited by the prospect of seeing a musical on the screen, but any film written and directed by Whiplash‘s Damien Chazelle and starring Hollywood sweethearts Ryan Gosling and Emma Stone deserves buzz, so as my girlfriends’s birthday drew near, it seemed like the perfect excuse to follow the hype and book that ticket. Between now and when the Academy Awards are handed out in February, you’re going to hear a lot of words like “masterpiece” being thrown around, but I feel this is a little premature. 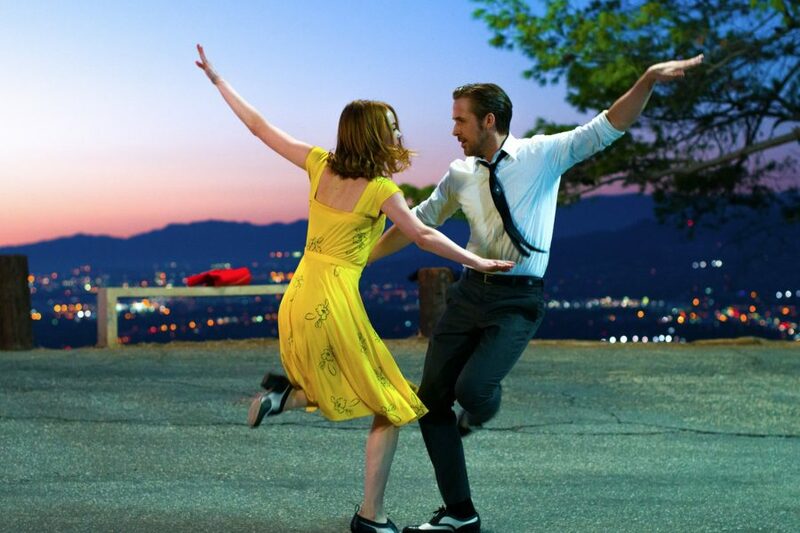 Viewers and critics are quite rightly excited by La La Land‘s invention. It’s fresh, fun, and incredibly enjoyable – but for me, a masterpiece must stand the test of time. In other words, will the masses be as excited to watch La La Land in 10 or 20 years’ time? At its heart, this is a simple boy meets girl story, and like any good love story, it’s tinged with tragedy. Who can’t relate to falling in and out of love, or wondering how different their life would be had they made different choices? It’s universal, for sure, and the excitement the film generates when our two lovers get to know one another is outstanding. I feel that anyone who has a deep passion for music and movies will love the setting of this film, and anyone who’s a fan of LA will enjoy the visuals because, well . . . LA is awesome! But I feel that viewers who are far removed from such lifestyles and professions may struggle to enjoy the film in the same way I did. She’s an actress, and he’s a musician. Now, if you’re an artist who has dated another artist, you’ll get what this is like. If not, you might not quite buy into their relationship. Also, it’s very much a story between the lovers. We don’t meet their friends, we don’t know their families, we don’t really know anybody other than the two main characters. Their story will translate well if you are/were a fellow struggling artist and can relate to their difficulties, but it might be a challenge otherwise. A musical’s long-term success depends almost entirely on the strength of its songs. The opening scene in La La Land is great, and the song is suitably catchy. The main theme music is beautiful, also. However, I don’t think the level is consistent enough to refer to it as a classic. After all, how many tracks stuck in your head the first time you saw The Rocky Horror Picture Show, Moulin Rouge, or Grease? By contrast, who remembers the film Nine, which had a phenomenal cast, a huge budget, but weak songs? Songs that are bad – or even just ordinary – don’t tend to be remembered too long. Before I saw La La Land, I’d heard several people make statements such as “it’s a modern day Grease.” I get the sentiment because it’s been a very long while since somebody made a musical this enjoyable, but Grease was very strong in the three key areas I’ve highlighted above. Why? Even though we didn’t all go to an American High School, it summed up what school is like almost perfectly. School is where we become real people, developing opinions and relationships whilst even our bodies are still changing. Everybody can relate to how awkward a time it was, but also how fun it could be. We all have memories of school, good and bad, and that is what makes Grease so damn relatable. Because the film is set in and around school, there are scores of supporting characters. This adds layers of complexity to the story, and ultimately our main characters, because we see them through many people’s eyes, shifting perspectives and social groups all the time. This is incredibly important when it comes to the longevity of the movie. Grease have a killer soundtrack – nuff said. What I’ve found really interesting is people’s reaction to the fact Emma Watson and Miles Teller were very nearly cast in the leading roles. It seems the general consensus is that the film wouldn’t have been as strong with them in it, but I’m not so sure. Yes, Gosling and Stone have that existing star quality, but I think Emma Watson would have been a very interesting choice, and Damien Chazelle has already proved he can get the best out of Miles Teller, so suggestions they wouldn’t have pulled it off seem harsh and unfounded to me. In fact, I don’t think Gosling and Stone have the greatest voices, so it would be interesting to hear how Watson and Teller compare in that department. I still find it surprising when I see or hear negative comments about Ryan Gosling’s acting ability. To me, he’s an actor who has a timeless quality, like James Stewart. I literally think these guys could be placed on earth in any given decade and they’d deliver strong, understated performances. It’s not easy to do what they do, and I’ve always admired both actors for it. So . . . I’ve established what I thought the film wasn’t, and also had my say on the casting. Now let me focus on what the film did well. Technically, I thought it was astounding. Anyone with an ounce of filmmaking experience knows how hard it is to achieve the results of La La Land. The sets were elaborate, the lighting was incredible, the cinematography was phenomenal, the long takes were jaw-dropping, the editing (where they made you think it was a long take) was sharp, the dancing was cool, the music – in the main – was solid, and I thought the performances were very much on-point. There were even moments of Disney-esque magic thrown in for good measure, so all-in-all, it was a great watch. As a writer who loves LA, I had every reason to love this film, and it delivered. I completely bought into the relationship of the couple who fought all odds to succeed in their careers, and I found it painful to watch how their personal success was slowly taking them apart. I found it truly absorbing, but will I be as excited to watch it again in the future? And will I watch it multiple times? I’m not so sure. Jody teaches many writing courses as either part of a group or on a one-to-one basis. To find out more, visit our creative writing seminars page.